As Facebook willed it, you cannot chat on Facebook without using the Messenger app and many Android smartphone users are running both the Facebook and Messenger App on their devices to continue chatting with their friends. These two apps from Facebook are confirmed from reliable test to be the biggest drain on your batter and data. We had earlier outlined recommendations that can conserve data on Android as well as how to keep your Android smartphone battery healthy and last longer. One of the recommendations was to shut down completely (greenify, freeze or uninstall) the Facebook app and use the web version on your mobile browsers instead. However some people still love the sleek user interface of the Facebook app but still annoyed when redirected to the messenger for chats and especially the chats heads. Therefore, this article will show you a work around to re-enable the chat feature on your Facebook app, so that you can run only one app for chatting instead of two battery draining apps at the same time. 1. 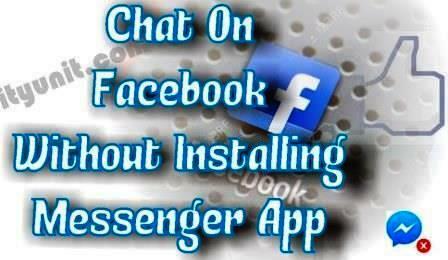 Click here to download and install Facebook ChatRe-enabler (65kb). 2. Once installed successfully, restart your phone and open the Facebook app and enjoy your chat without going to Messenger. 3. Once confirmed working, deactivate chat on Facebook Messenger by uninstalling to save memory, data and battery. IF you still cannot chat on your main Facebook app, follow the following steps to rollback your Facebook app to an earlier version before installing Facebook chat Re-enabler. 1. Check your currently installed Facebook version number. Go to Settings > All Settings > Apps > (Locate Facebook under the list of “Downloaded” Apps), Tap on Facebook and view the version number. 2. If your version is v28 (or above), you will need to rollback to Facebook v27 by uninstalling the current version. (if your Facebook app came with the phone as system app, click here to learn how to uninstall system apps). 3. Check your Android version number and download the v27 apk appropriate to your Android version number. Go to Settings > All Settings > About device (or Phone) > Android version. 4. Download and install the Facebook apk file. 6. Open your newly installed Facebook app and chat without having to go to Messenger. 7. Once confirmed working, deactivate chat on Facebook Messenger by uninstalling to save memory, data and battery.